Whether you are looking for a healthy snacking alternative to candy and chips or you are trying to preserve food for a longer time, digital dehydrators can be an ideal option. They offer a measure of accuracy and thanks to their modern design they look great in almost every kitchen. You may notice how old dehydrators that used dials and knobs for managing time and temperature are inconvenient. You need to change the settings whenever you dry a new meal. But, with the digital models, you just have to set the right parameters and let the unit do the job for you. Now, you must be wondering how to choose the model that will suit your needs. With so many different products on the market, it can be challenging to make this decision by yourself. That is why we have done the research for you and singled out the best digital food dehydrators on the market. Our selection includes adjustable thermostats, different digital features and multiple drying trays which will make the drying process much easier for you. So, if you want to know more about these models, all you have to do is read on. The Gourmia electric food dehydrator will surpass the expectation of every beginner and professional dehydrating enthusiast. This digital product includes precise control elements which will give you an opportunity to maintain the perfect temperature of your favorite recipe. It has 8 preset and computer-controlled temperature settings that can go from 95 to 158 degrees F. This device also comes with the 600 watts power capacity which is more than enough for the efficient food drying. Its fantastic capacity of 9 trays will provide you an opportunity to dehydrate large amounts of food without any difficulties. The great thing is that they are micro-mesh which mean that the air circulates efficiently through them, so you don’t need to rotate the trays. This unit is the perfect addition to your kitchen, especially if you love to prepare large batches of food for your family and friends. Aroma 815 dehydrator is one of the best digital models on the market which got our instant attention. When it comes to bringing performance and innovation in one package, there is no better unit than this one. Its digital controls are precise and excellent when it comes to managing the temperature. You can set the right one needed for the recipe you are preparing. Another great thing about it is that you can also set up the unit’s timer for the duration of the dehydration process. That way you can relax knowing that your appliance will do all the work for you. It includes a housing made of plastic with 6 trays that are removable and a fan. Thanks to its large capacity you will be able to dry all kinds of meals. The LEM 1154 dehydrator is genuinely one of a kind. It is made of stainless steel which makes it highly durable model. What we liked the most is its digital control panel from where you can monitor and manage the temperature and time of the drying process. It will allow you to save the settings that you will need for dehydrating some specific meal thanks to the three quick set buttons. Another great benefit of this appliance is its ability to shut off automatically when the food is done. That way you will prevent overdrying your snacks. This product includes 10 chrome plated trays which offer a large drying space of 16 feet. The heating and a fan are located at the dehydrator’s back and provide efficient and quick drying. L’EQUIP FilterPro Food Dehydrator is a very strong unit that provides 530 watts of power for drying different kinds of meals. It is a sturdy product that will keep your food free of contaminants thanks to the filtered air system. This feature will dehydrate your snacks with clean air. It features a timer that will shut off the unit automatically when your meal is done. That will prevent overdrying your favorite recipes. Let’s not forget that this appliance comes with 6 trays, but you can add 9 more, so you get a total of 15 of them. 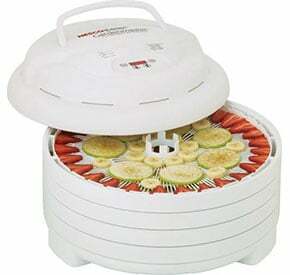 This large capacity dehydrator is ideal for preparing nuts, meats, fruits, vegetables, etc. However, because it is smaller than other models, it will be a great addition to some small kitchen. Want to learn more? Check our full review. This fantastic product will offer you a wide range of features and great dehydrating abilities too. It includes a 48h timer for the extended drying processes, and when the food is done it will shut off automatically. It also provides quick dehydrating times if you need for your favorite recipe. Another great benefit of this digital dehydrator is the fact that you can adjust and monitor the temperature as you prefer. You can also observe the process through the transparent door. The unit includes 9 trays and a drying chamber of 15 square feet. It has a square shape and makes a perfect addition to your kitchen. You can also place it on the shelf because it is not too bulky. Thanks to the digital control display the beginning drying enthusiasts will find this product easy to use. For those drying enthusiast who loves to prepare food for their large families and friends the Ivation 6 Tray Premium unit is the perfect choice for you. It is an excellent addition to any professional chef’s kitchen as it provides a powerful dehydrating experience. The product is made to offer different preparing options to its users. It includes a digital display which will make your drying process so much easier. You can set the time and temperature on a digital thermostat which offers eight different level for the specific meal you want to dry. So, you won’t have to stand in front of it checking the food every minute. Instead, just set the machine and leave it to do the job for you. The unit features 6 trays and a clear plastic door so you can monitor the process. Also, it has a power of 400 watts with a fan that is rear mounted which will allow an adequate drying. The Aroma Housewares Professional dehydrator is an excellent model for those who are looking for a serious unit with a limited budget. So far, it has mostly positive user reviews regarding its reliability, performance, and capacity. We liked it primarily because of its great digital features that offer which you will find very easy to operate. It includes an off/on switch that is built-in and adjustable temperature control, and has excellent features except for a timer. The thermostat allows the user to manage the heat which enables the snacks to be well dehydrated on the unit’s trays. This feature is adjustable and will provide you with quality service. It holds a capacity of 6 removable trays which means that you can rearrange them and place a larger amount of food in the unit. Also, this space will allow a uniform and very efficient flow of air which will provide an evenly dried food. Thanks to the transparent door, you will be able to monitor the drying process. If you are looking for the high-quality dehydrator that has a lot of drying space, then you are in the right place. The Chefman Food Dehydrator is the perfect model for you. What we can say with a guarantee is that this product operates efficiently and simple, so it is suitable for beginners and professional drying enthusiasts. Thanks to the digital display, you can set the time and temperature of the dehydration process, making sure not to overdry your favorite food. In fact, with this digital panel, you can set the right drying time. And the unit is also very powerful – to be precise it features 480 watts of drying ability. What we liked about it is the innovative heat saving design, which will help you to preserve the right temperature. The product includes 6 spacious trays where you can dehydrate larger amounts of food. The door is transparent so you can easily monitor the meals you are preparing. When you invest in the Nesco FD-1040 Gardenmaster dehydrator, you can expect excellent, reliable kitchen appliance. It includes a programmable timer that is capable of turning the unit off before the food is overdried. Another great benefit of this feature is the fact that it includes a digital layout and you can set it up to 48 hours. This model also includes an adjustable thermostat that you can adjust from 90 to 160 degrees F. In our opinion every dehydrator should have its own thermostat, and if it doesn’t you need to get one. This one has a drying power of 1000 watts which is very impressive and can only mean one thing – the food is dried efficiently and quickly. Another excellent feature of this unit is air flow converge-flow technology. Thanks to it you don’t have to rotate the trays because they will get an equal amount of heat. If you are looking for an affordable kitchen appliance that offers the convenience of plenty of drying space and a digital thermostat, then this model might be the right option for you. As we already mentioned it includes a digital thermostat that ranges from 100 to 160 degrees F. That will allow you to prepare everything from thick pieces of jerky to some delicate food. And the unit includes continuous airflow and a 500-watt motor that ensures evenly drying process. It also features the built-in timer which can be set up to 48 hours which makes it one of those ”set it and forget it” models. The unit will automatically shut off and will never leave the unit on for too long. This product includes 5 trays and a fine mesh sheet that is perfect for dehydrating fine food like herbs. Thanks to the clear lid you will be able to monitor the food and turn the unit off when the meal is done. Digital food dehydrators are an excellent choice for those users who want to make the drying process more comfortable for them. These units come with significant advantages that will help you prepare your food in the easiest possible way. If you want to know more about this topic all you have to do is read on. This is definitely the first and the biggest advantage when it comes to these models. Setting the accurate time and temperature will prevent overdrying and give you the opportunity to manage the drying process. When you have all these digital features, your job will only be to push the right button, and you are good to go. No more breaking off tight dials or twisting of jammed knobs. These units come with digital display controls that are very easy to use. In fact, as we mentioned already, you just have to set up the right settings and leave the dehydrator to do the job for you. It is that easy, and you will be able to relax and spend some quality time with your friends and family while your unit is preparing the food for you. This is one of the best features on the digital dehydrators. When you want to check the drying process, all you have to do is look on the display. That way you will monitor and maintain the temperature and time remaining. The excellent thing about this advantage is that you won’t have to open the door to check the food, as this way you can change the temperature in the chamber which can lead to bad food products. Let’s face it, not only you will have a fantastic appliance for your drying food process, but you will also get a great addition to your kitchen. These units look very modern, and they will sync with the rest of your kitchen devices. All you have to decide which size of the dehydrator you prefer. If you have a small kitchen, then you should probably go with the smaller models. On the other hand, bigger units are a better addition to your large kitchen space. But of course, it all depends on your personal preferences. When you own a digital dehydrator, you won’t have to worry about overdrying your food or leaving the unit on for too long. And with the regular one you are never sure if the unit will shut down on its own or when it is going to shut down. That is why the digital dehydrators are a better choice for those busy users who don’t have enough time to spend in front of the unit. Shut-off feature is a great addition when you want to leave your device overnight, or when you need to go to the store while the unit is on. Digital dehydrators are an excellent option because of the great programmable settings features they include. As we already mentioned before, you can easily set the temperature and the time of drying process and leave the machine to do the job for you. You can use different settings for different kinds of food. There are a lot of pieces of information about the digital dehydrators that customers need to know. We have singled out the most common questions and queries that users usually have, so we can help you make an informed decision on which device is the best for you. Keep reading to know more about this fantastic units. Q: How to set the time of the drying process? A: Most of these units have – and + buttons where you can easily set up the time for your next dehydration session. Also, some of them have up and down buttons that are being used for these operations. And if you can’t find any of them, look at your devices’ manual instructions and find out how you should use it. Q: The dehydrator’s display doesn’t show any number, what could be the reason? A: This can happen when some minor problem occurs, and the control panel might be malfunctioning. All you have to do is reset the device and try to turn it on again. You can check out the instructions to learn how to reset it, or you can always call the manufacturers to find out the procedure. Q: What should I do when water gets into the display panel? A: Turn off the dehydrator immediately and don’t plug it in for a while. Just let the device to rest for some time. The water should evaporate. But if that doesn’t happen, take the dehydrator to the service center, so they can check it out and fix the problem. Q: How to set my timer to dry the food for a more extended period, if it has a limitation? A: You cannot set the timer more than its limitations, but you can set it after the first session is done. You just need to check it up to see when it will turn off, and then you can set the timer one more time for another couple of hours as it is mentioned in your favorite recipe. Q: How can I get the sticky residue of the trays after I have dried the fruits? A: All you have to do is remove the trays from the dehydrator and soak them into the warm water and solution of soap. Leave it to rest overnight and tomorrow morning just scrape away the residue with the brush. The waste should come off easily this way. Q: What should I do when the fan makes some strange noises? A: Near the fan assembly there must be some loose part that needs to be fixed. But first, you should check if the dehydrator is placed on a stable surface where it cannot move while operating. And check if the trays are correctly positioned inside the unit. After that, if the fan still makes a strange noise, you should take the device at the service station so they can find the problem and fix it. Q: How can I make sure that my device will turn off when the dehydration time is over? A: The first thing you should do, when you get the dehydrator is to read the instructions that you will get with this device. There you can see everything you want to know about unit’s timer and how it operates. When you set it up, it will start counting down backward until the dehydration session is done. Q: Where can I find more about dehydrator’s warranty information? A: Check the manufacturer’s website and find information about the model you have purchased. You will there find more about the product and its warranty. Finding the perfect dehydrator model sometimes can be hard. That is why we have written down these reviews to help you make an informed decision and choose the right one for your needs. The best part about them is that they will make drying process so much easier for you. And what makes these devices a must have in every kitchen is the fact that you can set the time and temperature clearly and precise. The great thing about them is that you can also set the dehydrator to shut down when the timer is over. That is excellent news for all those busy users who don’t have enough time to check the food all the time. It doesn’t matter if you are a beginner or professional dehydrating enthusiast, these units make an ideal addition to any kitchen. Follow the instructions that you will get with the device, set up the right time and temperature and let the dehydrator do the job for you. No wonder, many consumers call them “set it and forget it” machines.